Amavida Coffee and Tea is an importer, roaster, and purveyor of Organic and Fair Trade specialty coffees. “Amavida” was born from a combination of Spanish words for love, “amar,“ and life, “vida.“ Their goal is to build meaningful relationships with coffee farmers, suppliers, employees and the environment, while sourcing premium Fair Trade Coffee beans and serving delicious beverages to customers. The company is a Certified B Corporation and Florida Benefit Corporation, known as a B Corps. 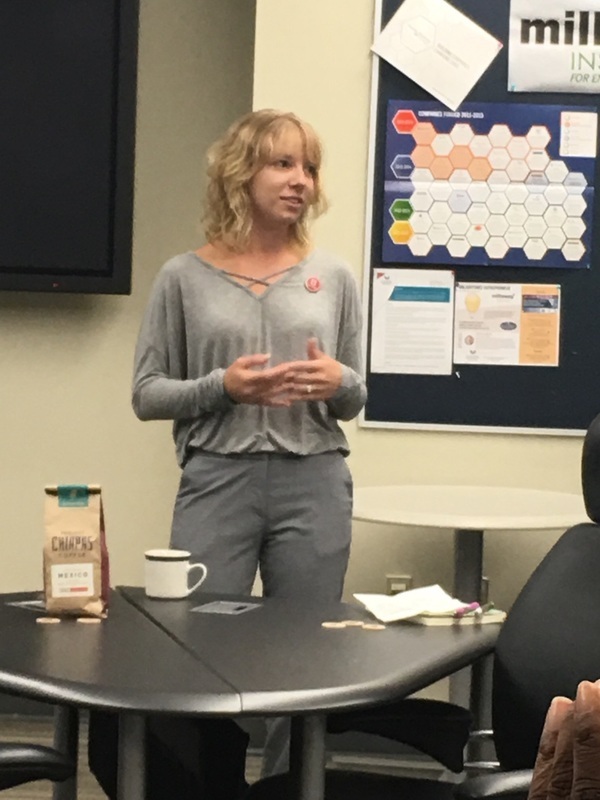 During the November Coffee and Conversations, Jennifer Pawlik, Project Coordinator and Benefits Officer for Amavida shared her experience with the application and evaluation process in which a company must undergo to gain B Corp Certification. B Corporations redefines success in business. Certified B Corporations meet high standards of social and environmental responsibility. Companies that strive for this certification are a part of a collective movement to do “business for good.” See more to Become a certified B Corp. Effective July 1, 2014, Florida joined the growing number of states that permit special types of for-profit corporations to pursue substantial public interest goals at the possible expense or deferral of profit maximization. The legislation allows companies to form either a benefit corporation or a social purpose corporation, each having unique criteria. See article in the Florida Bar Journal. Businesses that strive to implement a core value of giving and global social responsibility may find that becoming a Florida B Corp a solution to ensuring a sustainable model.